The ongoing controversy about too much fluoride in our drinking water has finally resulted in the US department of Health and Human Resources (HHS) lowering the recommended level of fluoride in community drinking water. This was announced April 27, 2015 in a news release. Americans now have access to more sources of fluoride, such as toothpaste and mouth rinses, than they did when water fluoridation was first introduced in the United States in 1945. As a result, there has been an increase in fluorosis, which, in most cases, are white marking or spots on the tooth enamel. The new recommended fluoride levels will maintain the protective decay prevention benefits while reducing the occurrence of dental fluorosis. Since community water fluoridation has led to a dramatic decline in both the amount and severity of tooth decay, it is considered one of 10 great public health achievements of the 20th century by the CDC (Center for Disease Control). For the past 70 years, communities across the United States have found that fluoride in their public water systems significantly improved their residents’ oral health. While fluoride naturally occurs naturally in most water systems, levels are often too low to prevent tooth decay. 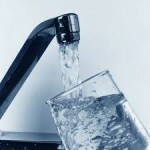 Nearly 75 percent of Americans with public water systems receive fluoridated water. The use of fluoride during orthodontic treatment at Affiliated Orthodontics reduces the chances of white spots or decalcification that can occur around the brackets with fixed appliances. Children are not always the best brushers and fluoride is often prescribed during treatment as a preventative measure. On the day your braces are placed, we instruct patients how to properly brush and floss their teeth and may prescribe an additional fluoride mouthwash or toothpaste for at-home treatment based on individual patient needs. For more information about fluoride, or to schedule an appointment please give us a call at our convenient Peoria AZ office!